Calm and loyal, the __"Xolo" tends to display a strong, primitive pack instinct and desire to guard what they consider to be their territory. An excellent watch dog, they will certainly let you know when strangers approach. It is important that owners are aware that this dog has a high predatory drive which can make it dangerous to have around smaller dogs and household pets. The Xolo can be trained, but it is recommended that training begin early. This is a dependent breed, preferring to be around its people whenever possible; they do not do well when kenneled or left in the backyard alone. Though this dog is good with children, it is best with those that are older. There is little upkeep for this breed. It is important that owners of the hairless variety take care to insure that their dogs do not spend long periods of time unprotected in the sun, and that they do not get too cold. The hairless Xolo must also be bathed every two weeks in order to remove dirt and oil build up that can cause painful and irritating skin conditions. Coated dogs should be brushed weekly. Owners should be aware that a bored Xolo will dig under or climb over fencing so it can get away and explore. There are no known health concerns for the Xoloitzcuintli; however, it is important that those who own the hairless breed keep and eye out for skin irritation. The hairless breed is prone to skin conditions such as clogged pores and flaking skin that can require special shampoos or bathing. Revered in ancient Aztec times, the Xoloitzcuintli was believed to help the dead survive passage in the underworld. Indeed, this breed is still believed to be a mystical healer in Mexico and Central America, with many villages believing they ward off everything from asthma to arthritis. This is a dog that can be found in artwork by famous painters such as Diego Rivera and Frida Kahlo and the Xoloitzcuintli is the national dog of Mexico. 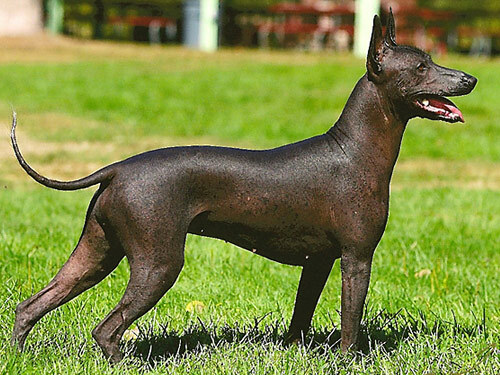 It was first registered with the AKC in 1887 as the "Mexican Hairless", but original breeding failed as there was no large-scale breeding and little interest. The breed was dropped by the AKC in 1959 but re-accepted in 1996.